Well, what an interesting day yesterday was! 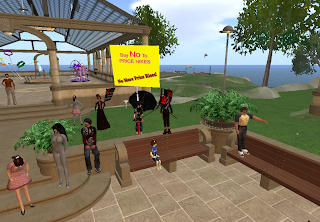 I logged on, to be greeted with several messages about the price increases in tier fees for Openspace SIMs, and headed over to one of the protest locations to see what was going on. When I arrived, I met Loki and Myrtil, along with several other kid AVs and a HUGE number of other people, all talking and discussing the increases. So what is it all about, and how does it affect us, your average (who, us lot? heheh) kid AV? Well...... from my research, seems Openspace SIMs were originally designed for open spaces, water, forest and such, and had a limit of 1875 prims. To be honest, they were not that attractive, quite highly priced, took ages to deliver, and apart from scenery, not much use for anything. Then the price dropped dramatically, the number of prims increased to 3750, and they were delivered almost immediately. It was also possible to buy them (you had to own a full SIM), then pass ownership to someone else! Overnight, they became very popular, and the areas we had to explore expanded wonderfully! Often they have been used as residential SIMs, with lots of space and not many prims. Places like Goony Island, which was in danger of vanishing, found a new and affordable place on an Openspace SIM, keeping a wonderful place for anyone to explore. Many of our friends now live on Openspace SIMs, where, for a modest rental, they have space to live and play. New sailing, flying and frankly wonderful builds were made available for us to use, because residents could afford to have a SIM that they could leave mostly as open area. Unfortunately, it seems some people decided they could be used for heavy use, such as clubs, and, an Openspace SIM being used heavily affects the performance of the other Openspace SIMs using the same processor. 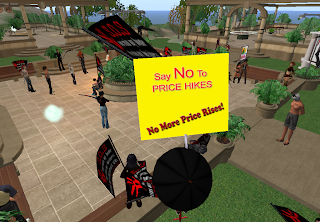 This has lead to complaints by residents, and Linden Labs have decided that the solution is to raise tier prices by 67% from January (on existing and new Openspace SIMs), and to increase the initial set-up fee by a similar percentage. To be honest, I can't see how that will actually help, and from what I have read on the blogs, neither can a lot of people. What it effectively means for us as kid AVs is that, with people no longer able to afford the tier, many of the places we have learnt to love and explore over the past few months will vanish. My feeling is that without these places, with sl a poorer environment for new people, we will see less staying and contributing to our communities. This is a sad situation, and I hope that Linden Labs will reconsider, or we will all end up the poorer for it. There is a JIRA on this issue at https://jira.secondlife.com/browse/MISC-1776, and you can follow the forum discussion at http://forums.secondlife.com/showthread.php?t=289652&page=1&pp=15 - have a look at what is being said and discussed. very good summary. I also attended the peaceful(mostly) demonstration. I feel very strongly for the people affected by this crisis. It seems that Linden Labs made a critical error in expecting people to self regulate and now have made an even more critical error in expecting that price raises are the answer. This is a case where they should find a solution that does not destroy so many beautiful sims. It will be interesting to see how this plays out. My greatest complaint against Linden lab is their poor foresight and not putting a "governer" on the openspace sims servers that allowed them ONLY 1/4 of the resources. How hard would that have been?